Where have I been? asked no one. I haven’t posted since July. Since I’ve previously only lived in NYC, which is decidedly democratic, the experience of living in a swing state with the non-stop barrage of political ads left me in a fetal position and under the covers. And now that the campaign is over I can share an experience or two with you. As a result of a car accident, The Husband has symptoms of something called meniere’s disease which can cause temporary deafness in one ear. As I sat on the sofa watching TV one night and he at the dining room table listening to the TV, I noticed him shaking his head and rubbing his ear. He kept losing his hearing and couldn’t figue out why the meniere’s was so bad that night. Finally he realized that I was was muting the TV every time a political ad came on. He thought his meniere’s was really bad that night and he couldn’t figure out why his hearing kept coming and going! My friend’s husband, John, has lived here for over 20 years but never became a citizen. He finally became one this year and was so exited to cast his vote for president for the first time. In an ironic turn of events, he got home that night to discover he got his first Jury Duty notice. The top watercolor was done in a sketchbook for a class I’m taking called Nature’s Notebook. We hear lectures on plants and then draw and paint everything flora. The building was done in a sketchbook with the NYC Urban Sketchers in Brooklyn, NY. They are a wonderful group and if you’re in NYC check them out. Anyone can meet up with them and all levels are welcome. Back to my fetal position for the next 4 years. Thanks for reading. I decided to take a drawing class at the local community college. That class was full, but they offered a class called “Nature’s Notebook” and since I’m now surrounded by a whole lot of nature I thought I’d give it a whirl. The instructor, an avid gardener and artist named Peter Loewer, a/k/a “the wild gardener” brings in items from his garden for us to draw. He will lecture a bit at the beginning of class about styles of drawing and particular drawings of plants and then we begin drawing. I was in the art studio one day when some women from NY came in looking at the art. One woman who had a thick NY accent told us about the NY Accent test. If you pronounced dog just like log, hog and fog, congratulations, you have failed the NY accent test. However, if you pronounced dog unlike the first 3 and more like dawg, congratulations you passed the NY accent test! Why are emojis so damn small? People text me with emojis all the time and I have no idea what they are sending. I need to know if someone is sending me a picture of a dog, a monkey, or a martini? However, If there were martinis involved with said laundry, I might rush right over to help! I was pondering this emoji issue last week when comedian and talk show host Stephen Colbert discussed this same problem. He couldn’t distinguish between the “crying” emoji and the “laughing so hard you are crying” emoji. He accidentally sent the latter when a friend’s pet died which caused some problems. I’m just gonna stick to the old fashioned colon dash parenthesis : -) face so as not to screw things up. I’m also working on a new Mac computer after years of working on PCs. Insert very frustrated emoji face here. Green Acres But I never lived on Park Avenue with a penthouse view. The above painting is a view of one of the buildings in Asheville glimpsed while driving by on Interstate 240. I just found out it was Inktober. Who knew? Teresa, for one. She, along with others, have been featuring Inktober on their blogs. 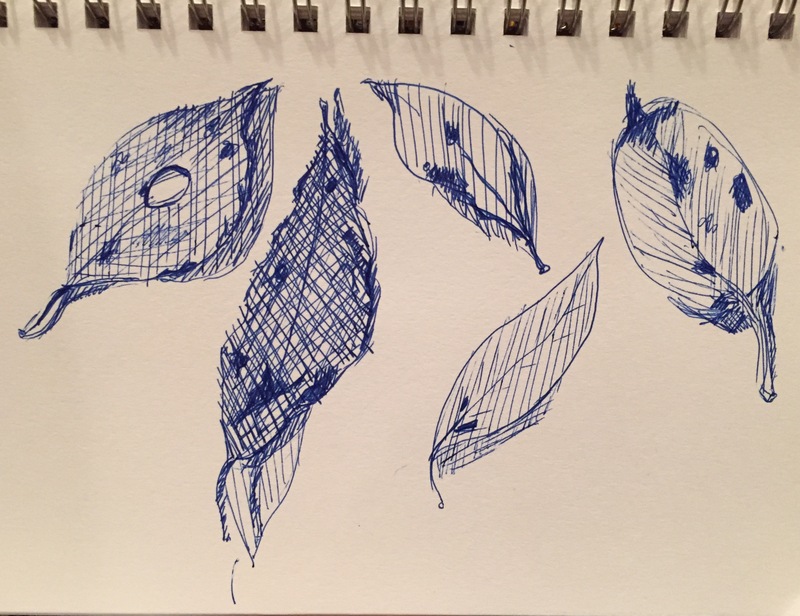 One does an ink drawing each day in October. Well, that’s not gonna happen here. I got boxes to unpack. Lots and lots of boxes. But a break in unpacking is always nice so I figured I would join in the Inktober fun. I can procrastinate with the best of them! 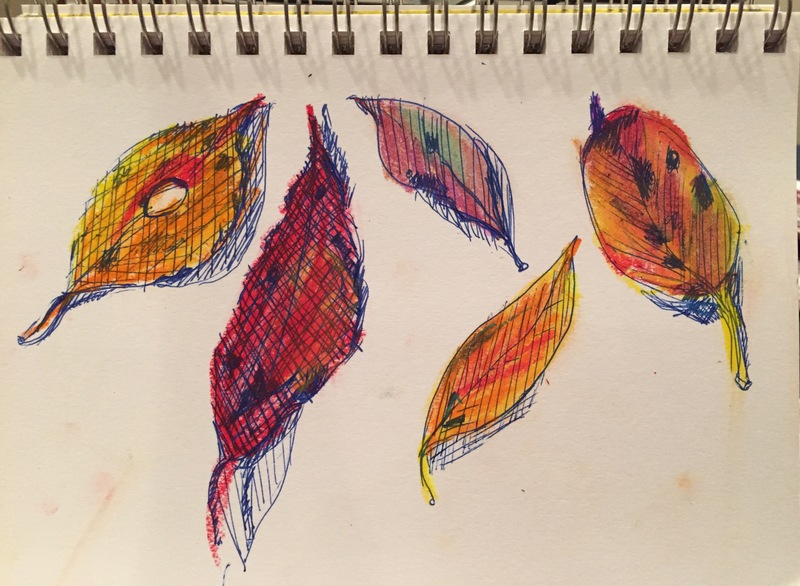 During a dog walk I found these beautiful autumn leaves which was my Inktober inspiration. Not being able to find any real art implements I used a pilot ball point pen for the drawing. Then added some color using some kid’s oil pastel crayons I found. Each day holds new surprises in box opening. When I was packing up the apartment, everyone was talking about the book “the life changing magic of tidying up” by Marie Kondo. 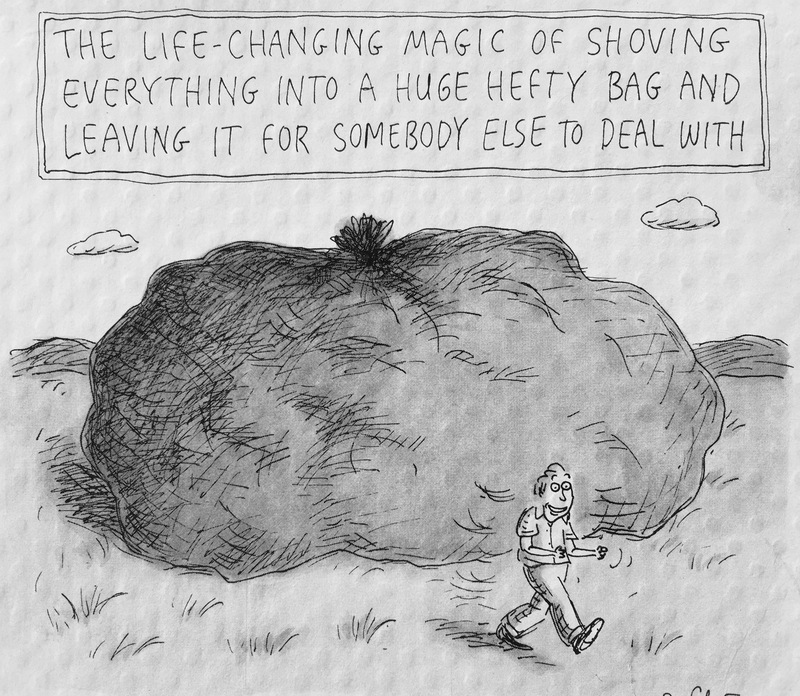 I thought I did quite a bit of life changing tidying up. But not enough. My sister sent me this cartoon today which made me laugh. While laughing I went on Amazon and bought the book. I’ll let you know how it turns out. I hope I actually read it and not put it on a shelf with all the other self help or informational books that I buy and don’t read thinking that if I own it, the information will magically transfer to me. I realize now that’s not how it works. But there’s always a first time!